This is a review that has been a long time coming. I think the most important thing a word processor can do is get out of your way. What I mean is that Hemingway wrote his genius on a napkin while I sometimes write complete drivel on my expensive MacBook Pro. No matter what software you use to write, at the end of the day it is your words and not some arbitrary feature set that determines the quality of the final product. This is why I like Scrivener from LiteratureandLatte software. It is a word processor that attempts to help you with the words. Scrivener is not just a word processor. This application is as much about planning and organizing your writing project as it is about getting the physical words on the screen. The first thing you need to do with most writing projects is a bit of research. Using Scrivener I can capture all of my research in the same project that I am writing my masterpiece in. When writing legal briefs I have reference cases and statutes, exhibits, and a variety of other source materials. When writing for the Mac community I also have research materials that include screencasts, images, and web pages. It doesn’t matter. Scrivener takes just about anything I throw at it and organizes it in a research tab. Scrivener doesn’t make you monkey with getting your research and your document on the page at the same time either. It easily displays your research while giving you a separate typing pane with no troubles. Following this paradigm, Scrivener also has a virtual corkboard. Maybe I’m dating myself but I remember writing papers in school with index cards. You would summarize important points and ideas and then spread them out on a desk and start playing with their organization. Well the Scrivener developer must have had the same experience because Scrivener comes with a virtual corkboard and an endless supply of virtual notecards. All of your research and related documents are given their own index card which you can then shuffle and sort on the virtual corkboard. For those of you who remember doing this, it will feel like sliding back into a pair of comfortable shoes. For those among you that have never tried using notecards, I highly recommend it. Scrivener keeps an eye on how you move the cards around and sorts the underlying documents to conform. It also allows you to tie keywords to your notecards to make organization and retrieval easier on large projects. 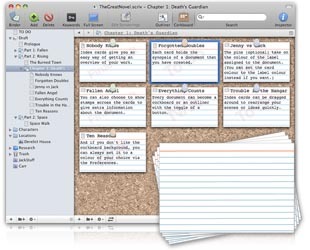 If you need to reduce your notecards to an outline, Scrivener has that handled as well. This outline is much more robust that found in other word possessors but not quite up to snuff in comparison to OmniOutliner. However, with the added bonus of being attached to your research and drafts, I don’t find myself missing OmniOutliner and for someone who likes OmniOutliner as much as I do, that is saying something. Scrivener also realizes that sometimes our editing can go a bit astray. The application has a “snapshot” feature that allows you to capture versions of a document during the editing process. You can then go back and retrieve that discarded treasure later when you come to your senses. It is a bit like Time Machine for documents. In addition to getting you ready to write, Scrivener makes the process of writing as simple and distraction free as possible. It has a very clean full screen mode that clears all the usual diversions off your screen and provides you easy access to your research. If you are a nostalgic old guy like me, you can even configure it to be green words on a black screen. I used to write for a newspaper on one of those old machines and every time I see this view in Scrivener, it brings back fond memories. One of the things I like about Scrivener is how it changes all the rules. Page formatting is not there. Instead you have these various chunks of text displayed in a visual way that is very conducive to making the actual words better and less prone to the white noise a lot of word processors can throw your way. This doesn’t mean you can’t do your standard formatting in Scrivener. It just doesn’t become your focus. If you are writing a screenplay, Scrivener also has built in tools for you that covers the basics of Script editing and exports to other scriptwriting software. I played with these tools a bit but have no experience scriptwriting and really have no ability to give an informed opinion on this issue. Once you’ve got your document written, Scrivener can print it for you or export it in one of several formats including Microsoft Word, text, HTML, and others. It even supports multimarkdown markup language which I’m told is important for typesetters but again this is a feature I don’t have any experience with. In summary, I really like what Scrivener does for my writing. It actually makes the words and documents better. Scrivener is substance over form. If you find yourself managing large writing projects, you really owe it to yourself to give it a try. Scrivener will cost you $39.95. The developer has a free 30 day trial. 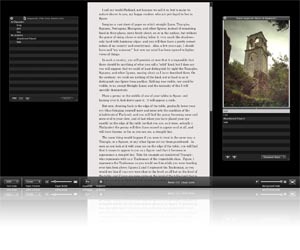 There is also an excellent screencast on the website to show you how Scrivener works.